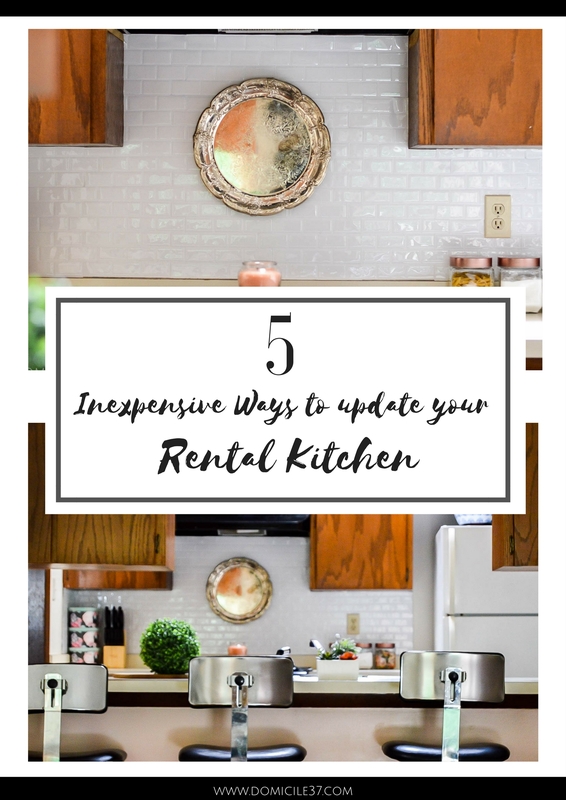 Although I do not currently live in a rental, I thought I could help when it comes to sharing tips on how to spruce up your rental kitchen. I feel very blessed that Kathryn from Up To Date Interiors has asked me to participate in sharing my knowledge about rental living. The past rentals that my family has lived in were the epitome of what rental life is truly like. 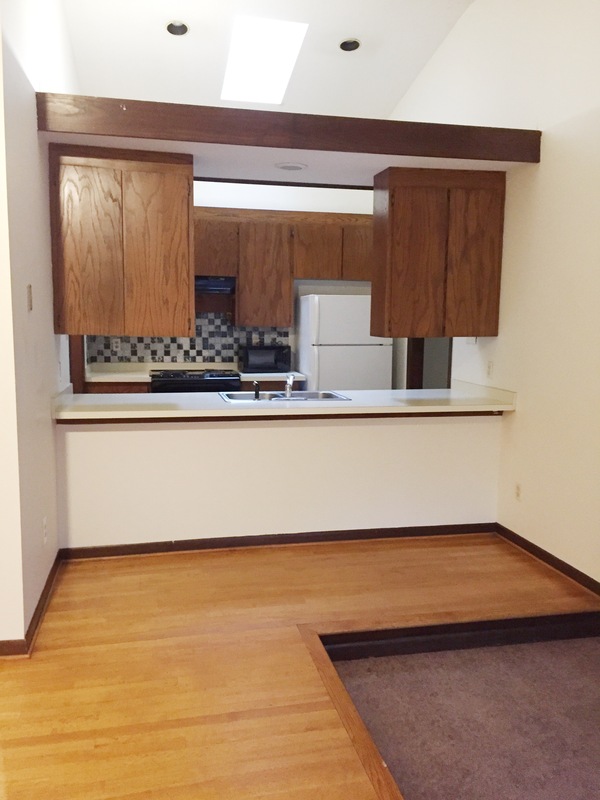 We did not have an updated kitchen, fresh paint on the walls, or even nice flooring for that matters. There was not much that I could do the home except for cosmetic changes. For this reason, I thought it would be only fair for me to share how I updated my rentals. 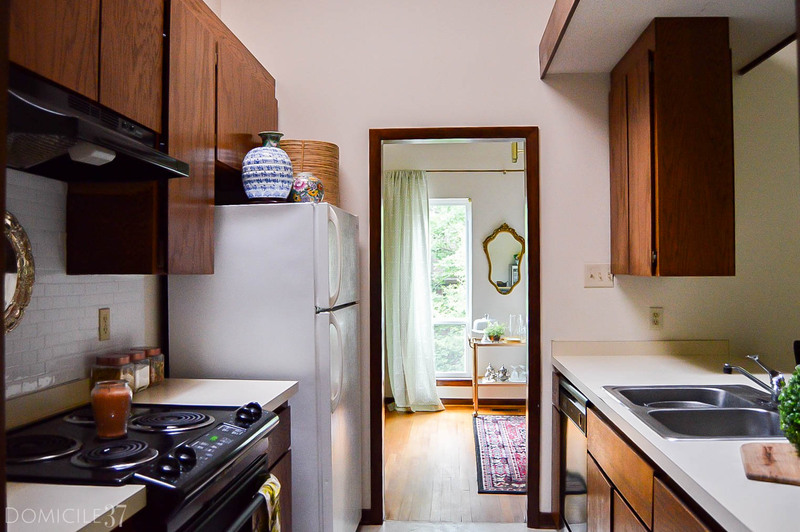 Just note, A dated kitchen does not mean it cannot be stylish….trust me, check out the before picture of our last rental space. 1. Paint/wallpaper- I lived in rentals with ugly paint jobs and crazy wallpapers and if your not Jenny Komenda or if your landlord will not allow you to make crazy rental request, you may have to LEARN to embrace what you are faced with and just make it work. One tip that I have given numerous time to acquaintances or people who are curious to how I “embrace” what I cannot change is, If it is dated or old offset it with something new or modern. By doing this, it gives your space a more eclectic feel and makes it feel less dated. If you are allowed to make fun request, try painting the walls or investing in rental friendly removable wallpaper. You may have to repaint your walls back to its original color prior to moving. If your landlord likes what you did they may reimburse you or request that the paint or cosmetic changes stay. 2. 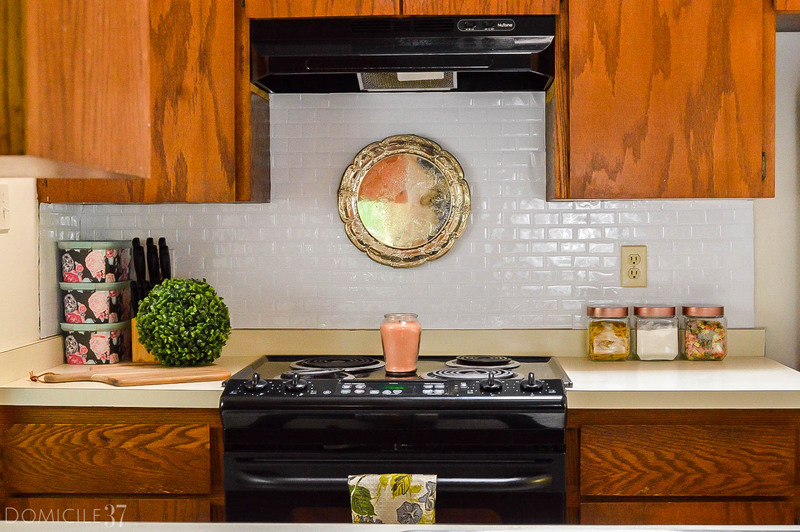 Smart tiles- Hate your backsplash? Invest in smart tiles. You can find them at your local home improvement store online, and even at your local Walmart. I once saw some for $7 a sheet at Walmart. If your lucky, you may even find them on clearance or on sale in your area. If they are too costly you can buy regular stick and peel tiles and cut them down and create a fun subway pattern. 3. Hang Art- Do not be afraid to hang up art up on the walls and make the space your own. Treat your rental as if it was yours. If you lack a window in your kitchen, hang a mirror above the sink to reflect light and give it a window-like appeal. Think of your counter as a well curated place to display your art. 4. Add Greenery- Brighten up your space by adding fresh greenery into your space. Plants always liven up a space and can make a space go from dull to airy. 5. Keep your counters clutter free- I know I just said, to think of your counters as a well curated place to display your art….but also keep it clean from household clutter. Place what you do not use on a daily basis in your cabinets. 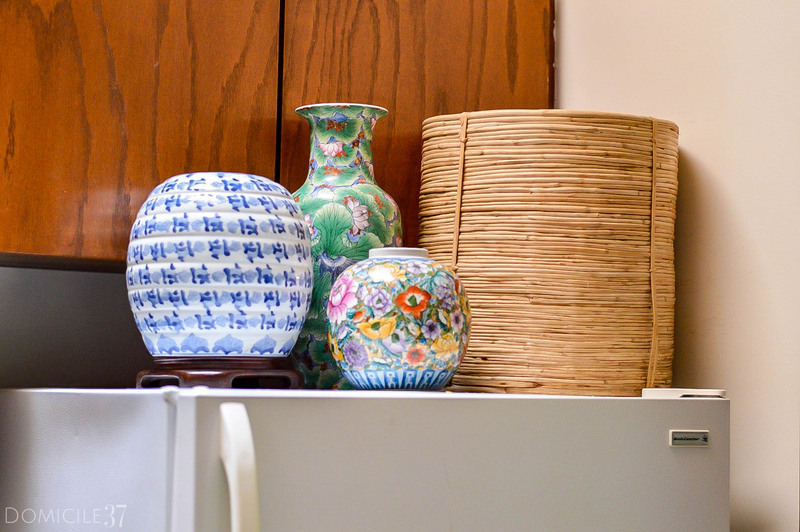 If you lack the proper cabinet space, use freestanding shelves or a hall closet as a form of storage or pantry. 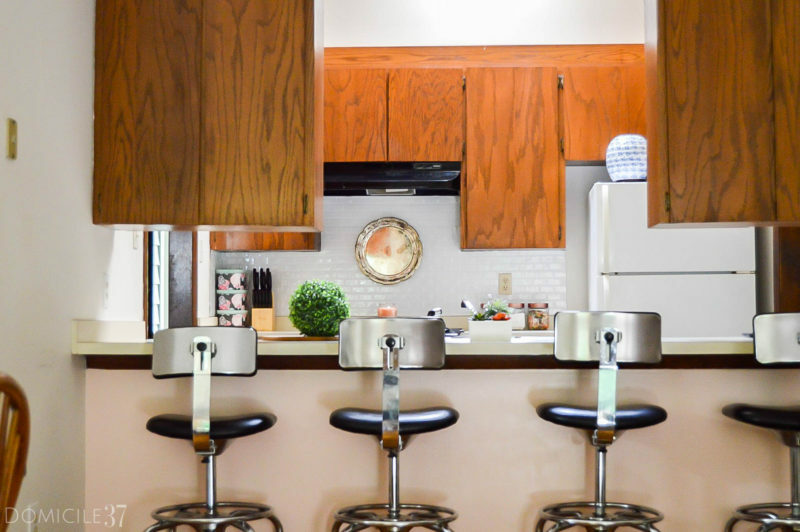 These are the tips I used when I lived in a rental if I may add, the kitchen may have not always been spotless but it surely felt like home and a place where I felt comfortable entertaining. Be sure to stop my girls The Home I Create and Up To Date Interiors to see what magic they make happen in their rental kitchen! I love those tips Jess! Using modern touches to change an outdated space into an eclectic one. The transformation of those stick on tiles, and curated counter tops with plants and art. Yes please! Good post!! Love all of the inexpensive furniture! Such pretty choices!